Photo of 'Big Jumbo' no. 271 Minotaur with an inspection saloon. Ted asks. "Where is it?" The signal box suggests that the location is on the Shrewsbury and Hereford Joint Line. The saloon is one of those to D.7 converted from a 42ft 0in Sleeping Saloon and which survived to BR days. The date is 1913 or later. I have found another print of this, on the back of which is written: "Garden Inspection train." But it does not give date or location. This station does have a "Shrewsbury and Hereford" look. Could it be Condover, which was in a cutting and the bridge seems to be in the right place? But I suspect that the cutting is too deep for Condover. Yes, I considered Condover, but the signal cabin is on the wrong side of the line. This is Moore station, on the main Grand Junction line, looking north-east to Warrington, three miles away. In the distance, 250 yards beyond the station, the two spans of Moss Lane overbridge can be seen; the arch on the right was the original bridge over the 1837 GJ line, the (plate girder?) bridge on the left was built over the 1893 deviation which climbed at 1 in 135 to the high Acton Grange viaduct over the Manchester Ship Canal. 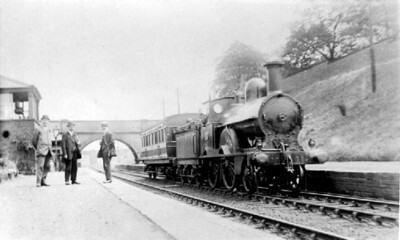 After the deviation line was opened the old line was used as sidings for a few years, but by the date of the photograph the sidings had gone and the main Up line passed under the GJ arch while the Down line went under the newer bridge. The signal cabin appears to be of Saxby & Farmer's 'northern' type. For such a tiny village, Moore was well-served by the railway. Just 300 yards away to the right was Daresbury station on the LNW & GW Joint - the old Birkenhead Railway. Moore station closed in 1943, Daresbury in 1952. The signal cabin is indeed a Saxby & Farmer type 6, a good number of which existed north of Crewe. This example at Moore is believed to have been erected in 1870; it was stated to be 14ft long. It was abolished in 1940 as part of the Acton Grange Junc resignalling. I had wondered whether the station was rebuilt as part of the 1893 deviation work, but Harry Jack's comments confirm the deviation only started north of the platforms, and the station remained in situ. The box got a new apparatus though. Since writing the above post I have checked the OS 25" map for 1908 and this has put a spanner in the works. The S&F box in the photo is clearly on the down side south of overbridge 56, while in 1908 the box was still on the down side but north of the overbridge. Therefore this box cannot be the one on the map! However, on the 1908 map there is a small square building shown in just the position of the box in the photo, and it could be about 14ft square. From February 27th to July 9th 1893 the deviation line over the new MSC bridge was open for goods traffic, but the old line was still open for passengers. So for at least five months there must have been a double junction between the two lines immediately to the north of the platforms. A new lever frame with 30 levers was ordered from Crewe signal works in August 1892, and a new cabin and apparatus was reported to the Loco Committee in March 1893. Twenty two of the 30 levers were in use. Obviously this was needed to work the double junction, and must be the cabin shown on the 1908 map. This new cabin would be out of site behind the overbridge in the photo, if indeed it existed then. It would presumably have been a standard type 4 cabin, but no evidence has been found to confirm this. The old S&F was still in situ, out of use in 1908. So far so good. Either the S&F box was retained after 1893 as a porter's room or similar, and was not actually in use for signalling purposes when the photo was taken. However this does not seem terribly likely at such a small passenger-only station, and in any case the levers and block shelf seem to be visible through the open window. Or the 1893 box was abolished and the 1870 S&F box reinstated as the station signalbox sometime after 1908. In fact, a new 10-lever frame was ordered from Crewe works in 1909, so this might be the date of reinstatement. Are we certain that it is a photo of Moore? I can't see where else it could be. A further look at old OS 25in plans might explain the puzzle raised by Reg Instone. So it looks as if Reg's suggested 1909 could be when the old small box was re-equipped and brought back into use.